A sawdust ceramic light pull. 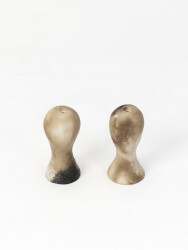 Burnished clay knobs are individually wrapped in tin foil, buried in a bbq filled with sawdust, set alight and smoked for 12 hours. A wide range of surface patterns and colour tones are achieved by controlling the clay's direct exposure to smoke with packaging and masking, and by seasoning the light pulls with banana skins and pine needles. Manufactured by hand in Granby, Liverpool. Granby Workshop, 2015. Lightpulls, Granby Worksshop, 2015, Crafts Council Collection: 2016.14 & 2016.13. Photo: Stokes Photo Ltd.